at "Once upon a .. Sketch" challenge site..
your journalling has to be HANDWRITTEN and at least 25 words in length..
remember you can create a LO, card, or any other project..
the journalling does not apply to you if you create "a card" or "off the page project"... just use the sketch and a quote of your choice instead .. I am sooo excited to be part of this amazing site ...full of inspiration and passion. have fun and I'm sooo looking forward to seeing all your wonderful creations..
Yooohooo Heather. Isn't this exciting???! I hope we get many many entries! it's a nice sketch and I'll try to participate. 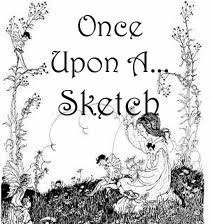 Long life to your blog and to "once upon a sketch" too.